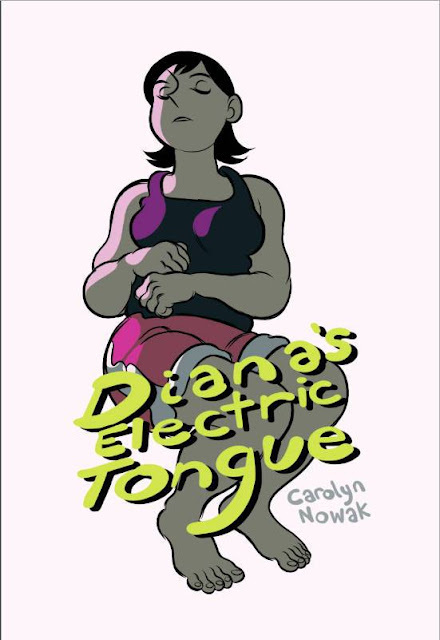 Lush, funny, and poignant in equal measure, Carolyn Nowak’s Ignatz award-winning comic Diana’s Electric Tongue was one of my favorite reads of 2017. 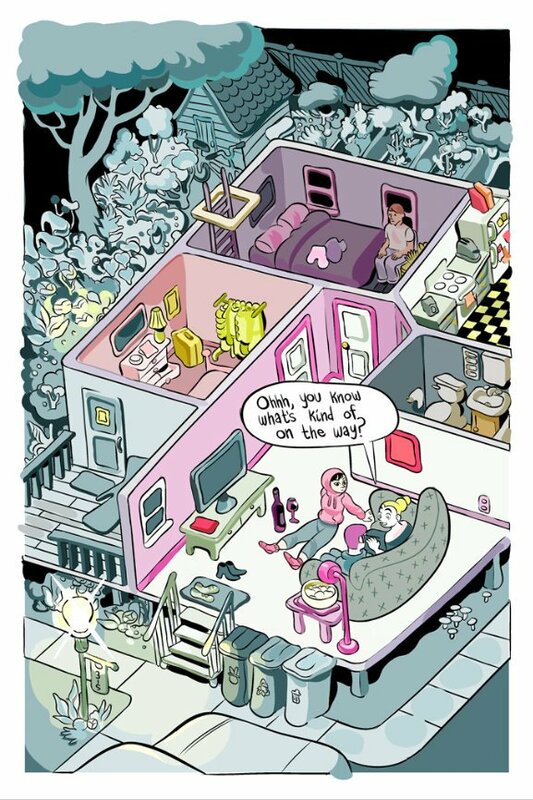 Following up her award-winning minicomic Radishes, this full-color, longer form work cements Nowak as a formidable force in indie comics. From its visual style to its narrative, Diana’s Electric Tongue lingers like the taste of a thing bittersweet, like the memory of your childhood home. Set in a future where humanoid companion robots are available - to those who can afford them - for a variety of purposes (mostly salacious), the story opens on Diana recovering from a difficult breakup. We find out immediately that this term is also figuratively apt. As she opens up his packaging, Diana explains to her insensible new “Harbor” model android that when she broke up with her famous boyfriend, Blue, she also got into a nasty motorcycle accident and bit off her own tongue. She opens her mouth to reveal the titular appendage, yellow and glittering.“…We both have robot tongues,” she tells him, and later in the book, when their relationship becomes physical, sparks literally fly between them as a result. But this isn’t a book about redemptive love so much as a book that draws a parallel between heartbreak and physical trauma, and which explores the driftlessness of burgeoning adulthood, a time of seeking and failing to find home and harbor in all the wrong places. The androids in this universe are unique in that they respond not only to commands but to “implicit desires”, as we later find out from another android that naturally became an excellent DJ in response to his owner’s unspoken needs. Diana’s roommate makes an early remark on her expensive purchase of Harbor, as Diana comes to call her android companion, that “I’d have bought a boat!” with the money, but Diana’s need to moor herself to something rather than be at the mercy of an aimless current becomes clear to the reader as well as to Harbor as the story progresses. Set adrift by Blue but unwilling to open herself up to another real person so soon, she confides in Harbor, who cannot hurt her the in the way that another person can. For Diana, he acts literally as a “safe harbor”, a place to dock. Nowak drives this home by showing Diana and Harbor lying side-by-side, Harbor’s body and Diana’s tongue both “docked” on the nightstand, charging, the moor-lines of their cords tying them down and together. 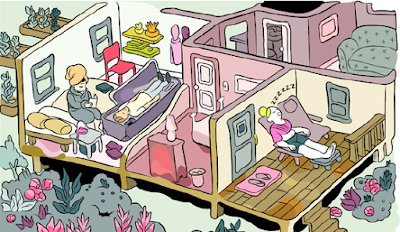 Diana works as a concierge by day, assisting people in the transient not-quite-living spaces of an underwater hotel that we never properly see. But the money for Harbor came from a different source. On the side, Diana paints what Harbor describes as “small houses”. 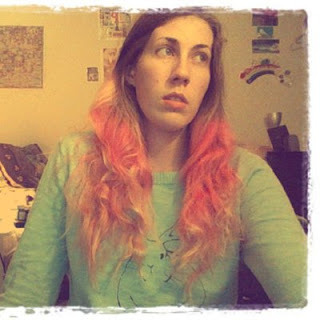 Diana self-deprecatingly describes her windfall painting, espied by the buyer in the background of a selfie, as big and ugly, and maintains that the sale of a different painting to Blue “doesn’t count”, but Nowak gives us the sense that her self-consciousness around her art bespeaks its personal nature. This self-consciousness mirrors her unwillingness to open herself up to being hurt again by a real human being. The trauma of her accident and her breakup are both as raw as the identification Diana has with her art. Diana’s Electric Tongue, here, maybe veers into the meta, or the semi-autobiographical, as the book’s most striking visual motif are its beautiful page spreads of cross-sectioned living spaces, amply sprinkled throughout. These beautiful illustrations are the best examples of Nowak’s soft, luminous visual style, and through size, space, and room-divided activity they mark the passage of time. Her drawings are vehemently opposed to sharp edges and boast a gentle pastel contrast between the warm, fleshy interiors and the cool teal verdure without. Everything in Nowak’s world has a vaguely gelatinous quality, muted pinks, mauves, and blues that never quite stop quivering. Her lines are energetic, almost gestural, as they effortlessly describe the volume of each form on the page. 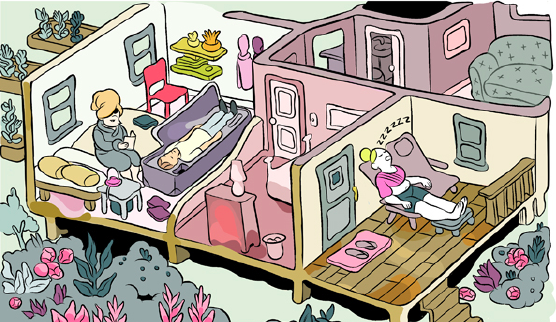 The book’s charming color palette belies its more serious themes. Nowak asks us to consider the messy entanglement of sexual desire, art, taste, and speech. Her relationship with Blue, a child actor who voiced a cartoon mouse upon which Diana nurtured a childhood crush, is fraught with these considerations. Blue has left acting behind, Diana confides to Harbor, and now works as a geneticist, developing quaint if not always practical new configurations of food, like onions that make you laugh instead of cry. After Diana’s accident, she receives an anonymous bouquet which reminds her of the hotdog-flavored flowers that Blue would make for her as a joke. The moment she tries a petal, however, she has the realization that her tongue is gone. Her new electric tongue, she sheepishly laments later, is “not so good” at tasting, but near the end of the book she admits that she had begun losing her appetite around Blue before they broke up. Again, Nowak reinforces Diana’s driftlessness as a result of her romance, a detachment from the kind of identity that an artist’s personal sense of taste helps to bolster. In contrast, a sense of taste is something that needs to be nurtured in Harbor. Near the beginning of the book, Diana resists naming him because she feels uncomfortable “defining” him. 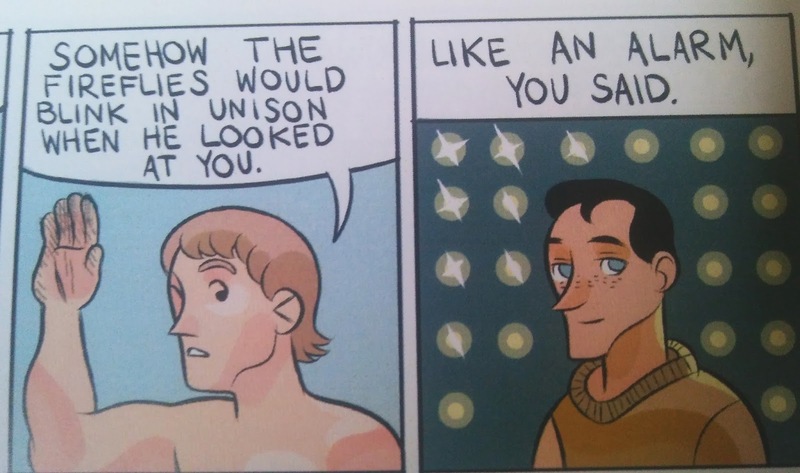 A few pages later, however, she asks him if he likes art and is disappointed when he responds only that he has the capacity to, that he could. Diana does not yet know that her implicit desires will shape Harbor, will alter him and define his identity. “I am a little less than a day old,” he gently reminds her. “I will have to acquire an appreciation [for art].” Diana herself, with a sense of taste shaped and prodded into place during her time with Blue, is coming back into her own as she takes on a more authoritative role in her relationship with Harbor than she had with Blue. Through both the physical and emotional trauma of her breakup and accident, Diana herself has been irrevocably changed. Her idea of home and haven, we imagine, must also have transformed. Has she become more like Blue, who is able to toss careers and relationships aside when he doesn’t want them anymore? 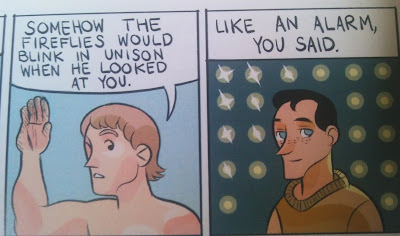 The book ends with Harbor composing a poem. Nowak masterfully juxtaposes images from Diana’s accident with Harbor’s simple, elegiac lines in the book’s most affecting set of panels. This sequence is powerful enough to elicit tears. It is the culmination of the book’s meditation on the things we tie ourselves to and build our selves upon, and the danger of building the foundations of our homes upon people. 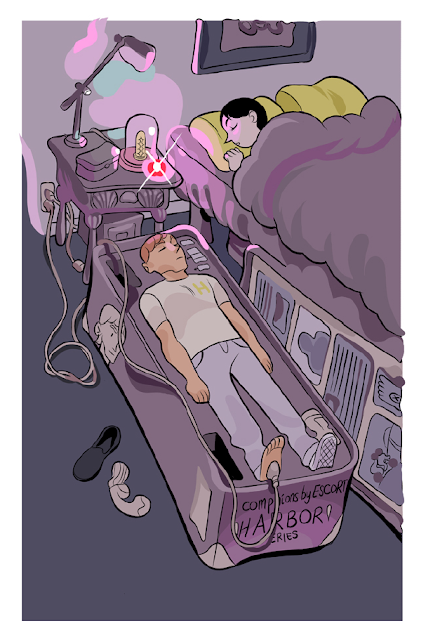 Harbor here acknowledges his own role as a conduit for Diana’s recovery, his whole being predicated upon her evanescent need for something – someone – to hold on to in an uncertain world. Diana’s Electric Tongue is a book that resists certainty, opting instead for an endearing complexity that feels organic and real. Nowak has managed, in a scant seventy pages, to craft a fully realized fictional world that is futuristic in the best way, but rejects easy answers. How do we define our own identities in the context of intense relationships? How much can we depend on other people, on loving and being loved, for our own sense of self? Diana’s Electric Tongue is less concerned with answering these questions than in creating a compelling narrative that raises and explores them. A highly recommended, visually sumptuous work of great emotional depth.